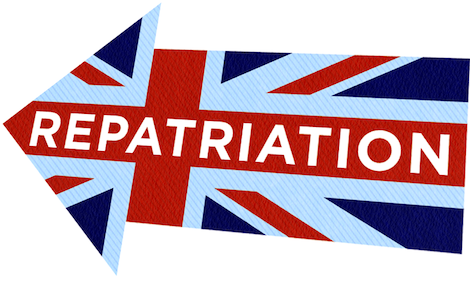 Home › Expatriate Services › Are You Returning ‘Home’ to the UK ? Are You Returning ‘Home’ to the UK ? Making the move back to the UK after spending time living abroad is not nearly as easy as one would think. There are a number of reasons why people decide to return ‘home’, most commonly, homesickness, new position and missing family members. Your decision to move home has likely took months to reach and moving home after spending an extended period of time living and working abroad can give way to a number of challenges, both emotional and difficult never mind the change of climate and way of life. The process of repatriating can become a stressful experience. Think of it as being similar to when you started your expat adventure, just without the hassle spending hours in a bank, opening up a new account in a foreign country! When considering repatriation, one must consider whether they are still a UK Resident or an Overseas Resident. This list of Criteria is helpful in determining which category you fit in. This should be step one when considering moving back to the UK. After April 2017, people will have to work longer, needing to make 35 years’ worth of National Insurance (NI) contributions, rather than the current 30, to qualify for the full state pension. Whether or not you will be awarded the UK State Pension is usually based on the UK qualifying years you have worked. You can however accrue qualifying years in the European Economic Area, Switzerland, or certain bilateral countries that have a social security agreement with the UK. We can assist by sending you a quick and easy 5 step guide to checking your NI contributions, just email me for details. earn before income tax becomes payable has increased to £11,000, up from £10,600. From 6th April 2017 it will rise again to £11,500. Those who fall into the 40% tax rate bracket can now earn £43,000 a year, up slightly from £42,385 in 2015/16, before having to pay the higher-rate of income tax. This is set to rise further to £45,000 in April 2017 with the Government stating its commitment to raising it to £50,000 by 2020. On the 6th April 2016 the standard pensions Lifetime Allowance (LTA) was reduced again, this time from £1.25 million to £1 million. Having peaked at £1.8m in 2010/11 anybody with an estimated pension portfolio approaching £700,000 or a projected retirement income of £35,000, must review their retirement plans now. Those who do nothing risk being taxed at a rate of 55% for any excess (amount above the lifetime allowance) taken as a lump sum, or 25% for any excess taken as income (in addition to your marginal UK income tax rate). We can assist with a free pension review, please email me for more details. to minimise or even eradicate any such liability and ensure that your life’s wealth goes to the people you want it to. tax payments simply because people did not seek proper advice at the right time. There are some very simple steps to protecting your wealth and they could end up saving you and your family a fortune. As of April 6 2015, all non-UK residents must pay CGT when selling UK residential property of any value. If you currently own a UK property, be it for residential or investment purposes, it is important that you are up to speed with the new Capital Gains Tax Rules introduced in 2015. When an asset, such as a house is sold or disposed of, Capital Gains Tax (CGT) is paid on any realised profits. The total gain is calculated by subtracting the sale value from the property’s when the rule change came into effect. If you haven’t already, you should consider obtaining a valuation of your property, even if you don’t intend on selling it in the near future. How you are impacted by UK CGT can differ based on your residency status. The tax rules in your current jurisdiction might make it advantageous to dispose of your assets before returning to the UK. If you have any questions or queries on ANYTHING above I would be more than happy to advise and speak to you on a one to one basis, either email or call me direct.